The day-long strike was called by a traders' federation and supported by various political and social organizations. JAMMU: A general strike today marked the reopening of the Civil Secretariat - the seat of the Jammu and Kashmir government – here as many opposition leaders including state Congress chief GA Mir courted arrest during protests against the alleged "failures" of the PDP-BJP dispensation. The day-long strike was called by a traders' federation and supported by various political and social organizations to highlight the alleged failure of the PDP-BJP government to address their issues. The protesters denounced collection of a toll tax on goods imported from outside the state and alleged discrimination against the people of the Jammu region. The Civil Secretariat and other move offices reopened here after a 10-day break owing to the pre-Independence practice of 'darbar move' under which the Jammu and Kashmir government functions six months each in the twin capitals of Srinagar and Jammu. Congress activists led by Mir took to the streets "to highlight the total failure of the PDP-BJP government on all fronts" and staged a sit-in. The protesters then tried to take out a march to the Civil Secretariat but the police foiled their attempts. Later, a number of Congress leaders and workers including Mir, its vice-president Sham Lal Sharma, chief spokesperson Ravinder Sharma and several former ministers and legislators courted arrest. "There is anger among the people against this government which has miserably failed to implement its election promises and live up to the Agenda of Alliance," Mir told reporters. Soon after the Congress protest, hundreds of National Conference activists led by party vice-president S S Slathia and provincial president Devender Singh Rana took out a march towards the Civil Secretariat. The police tried to stop them at city chowk. The National Conference leaders resisted and continued the march, raising slogans against the PDP-BJP government. After the initial resistance, the NC march was again stopped at Shalimar chowk where the police took Slathia, Rana and several other senior leaders into preventive custody. 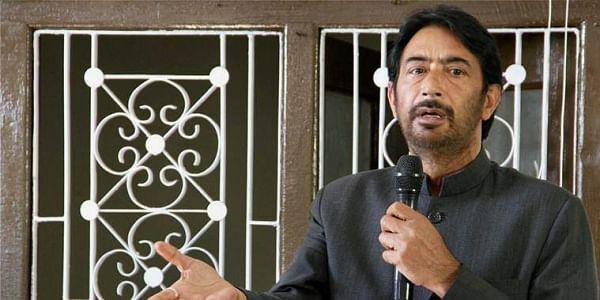 "The protest was against the governance deficit, lack of development and failure of the government to deliver on the promises made to the people of the Jammu and Kashmir," Rana said. "There is chaos and lack of development everywhere. This government has failed on all fronts," he alleged. The Jammu and Kashmir National Panthers Party and other groups also staged protest against the government here. In view of the strike, the main city markets wore a deserted look while public transport remained off the roads. The bandh call was given by Chamber of Traders Federation (CTF) to protest against continuation of toll tax on goods imported from outside the state and to press for public holiday on the birth anniversary of last Dogra ruler Maharaja Hari Singh. While many organizations including transporters, Jammu High Court Bar Association, Congress, National Panthers Party and Team Jammu extended support to the strike call, Bari Brahmana Industries Association (BBIA) opposed it. The BBIA said "the toll post is working as a tool to stop the import of unaccounted goods by vested interests". Market associations also distanced themselves from the strike call, terming the bandh as "unjustified". Members of Team Jammu blocked the Tawi bridge for over an hour in support of the bandh call, affecting traffic on the Jammu-Pathankote highway.